It is of course inevitable that similar features undergoing similar evolutionary pressures will convergently acquire similar form. 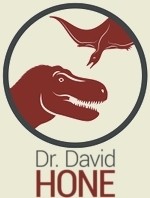 Here’s a nice example from the theropods. Above is the foot of Tyrannosaurus which is a pretty classic ‘running’ foot. 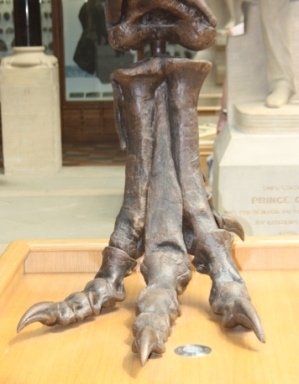 The metatarsals are compressed into a single main spar (which will add efficiency), and the toes are quite well spread (giving grip and stability). And below we have the foot of a moa. Despite the fact that there’s quite an evolutionary distance between the two, and of course that after the tyrannosaurs came long theropods had kinda become birds and been living in trees and flying for a good few million years before coming back down. But again we see similar adaptations, the metatarsals are now fused fully into a single unit, and the toes are rather well spread out. Having now past the 500 000 visitors mark, it seemed a good time to look back on this blog and see how things have progressed. 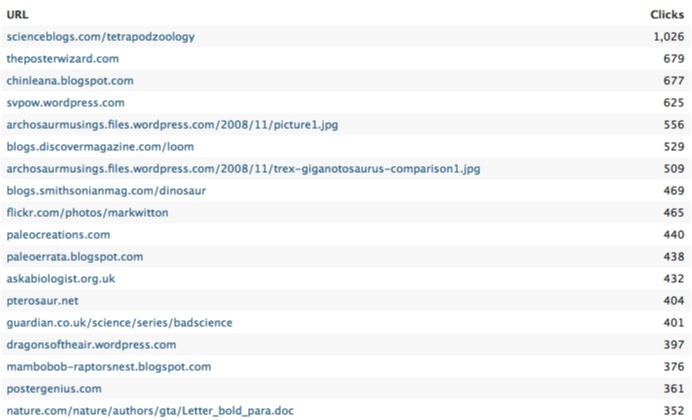 WordPress does have some decent stats and lists of things about the blog and from that I can draw dome reasonable inferences based on them, my own habits and what people have told me about this blog and their own. None of this is likely to be too surprising, but it might be instructive to other bloggers and certainly I’d be interested to see what patterns others have observed on inferred. As you can see this Musings has basically shown a simple but pretty consistent growth over time. 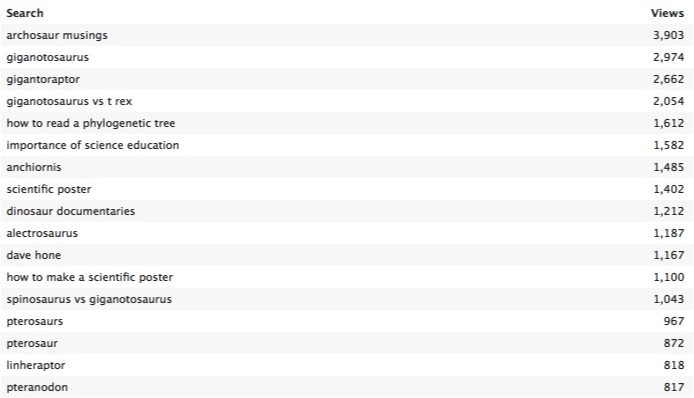 This month has of course been bolstered by Zhuchengtyrannus and some previous high months have been achieved by major new taxa (Darwinopterus, Limusaurus and especially Linheraptor). There is also a major dip from last summer where I spent both a long time in the field and my posts rather dried up for a while for a number of reasons. This certainly matches a more general pattern I see on my daily posts – I can easily drop a couple of hundred visitors or more a day when I don’t post anything, though while this drop-off occurs instantly, it can take a few days to creep back up, even if I am posting again just 24 hours later. This also speaks of my inability to grab new visitors – I get peak high days when a new taxon or whatever brings in a whole bunch of hits, but the next day it drops back to the previous level – I’m not gaining any significant new readers from such events. Obviously the homepage is streets ahead of the rest, though this perhaps also masks a number of other posts. Since I don’t use folds much, you can visit the site and read a dozen posts without clicking on them so perhaps the numbers are low for many posts. 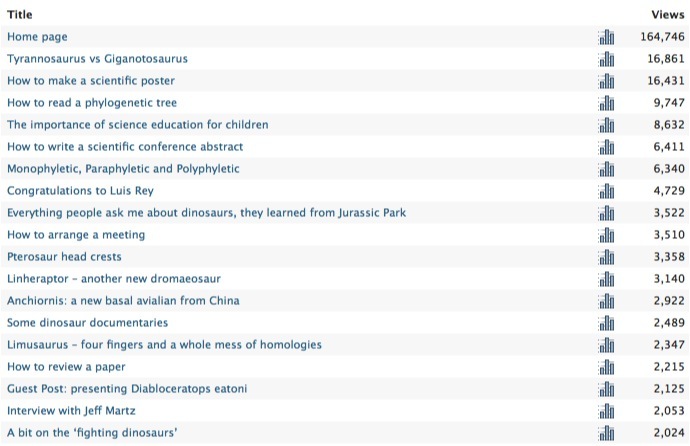 A few patterns are obvious though – real ‘bait’ like Tyrannosaurs vs Giganotosaurus and Jurassic Park are high, but also some of the most general posts I have done, and new taxa are clearly popular. In short, the things I tend *not* to write about and think are less important / exciting do indeed seem to be the most popular. Though of course these are perhaps popular because they focus on things I don’t usually cover and so draw in extra readers, rather than my usual audience. It’s also noticeable just how quick the drop-off is, a few hyper-popular posts and then a big drop. Once you’re past the top dozen or so, we’re into 2000-ish and lower. It’s also obvious that posts with numerous comments also tend to have far more reads and this makes me suspicious that this is linked to my (often) low number of hits for individual posts. With few comments and discussions, most posts clock up a single visit from any given reader and this *may* keep my numbers lower than some other sites. This is in itself informative but perhaps unsurprising again, because of my style of writing. I tend to produce short and simple posts that basically review well-known things or show off bones or museums or whatever. Other than my own work and guest posts, I don;t tend to cover exciting new papers, or controversial issues, or complex problems meaning there’s little for people to question or want more of. Coupled with my target audience of interested people who already know the basics, that again fits with what I would expect. I don’t think the lack of comments is down to a lack of readers. Well as noted, Tet Zoo and Chinleana have done quite well out of me as have a few others, but again, much as not too many links are driving people to me, I’m equally not sending my readers out into the wider world. This is likely in part because I have a short-ish blogroll that doesn’t provide updates on latest posts (and such a feature on other sites does often catch my eye, I admit). Still, the referrals here are quite even, there’s no huge drop-off or disjunct between the top and bottom of this bit of the list, so I seem to be spreading the love around so to speak. I’ll leave it there. I’m not sure I’ve done much here for myself other than confirm my own suspicians. 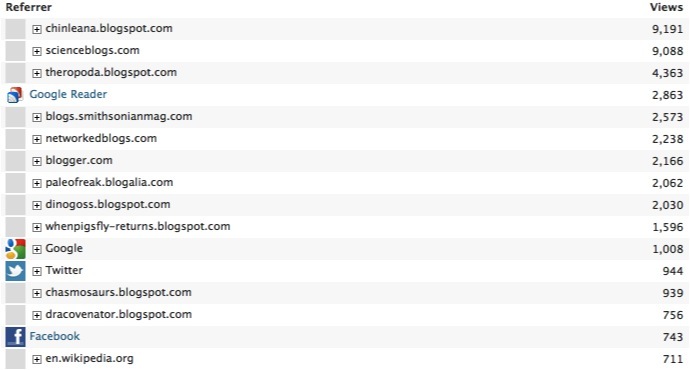 As noted though, this might be of interest to other bloggers looking to drive up their hits and I am certainly interested to see what patterns others have noted though their efforts or just their visiting patterns. Sadly I wasn’t able to get across to the recent conference on dinosaur tracks that was held in Obernkirchen, Germany. However, occasional Musings contributor Peter Falkingham did make it, and he was kind enough to write up an illustrated review of proceedings. Yep, the Musings has just hit half a million visitors on WordPress. I’m quite stunned. If you’re interested, it’s also racked up just under 5000 comments (though admittedly a great many are mine or trackbacks on other articles). There have been over 850 posts and I’ve written around 200 000 words! (and that is just by me, and doesn’t include all the text of the numerous guest posts and art interviews etc.) and there are nearly 1400 images on here (and of course there’s lots more posts and visitors racked up on Dinobase before I moved here). I’m genuinely not sure if I should be proud of that or frightened as to just how much I have ploughed into this (and I have some 700 answers on AAB as well…). Errr, wow. Today’s image comes courtesy of Phil Mannion and something he sent me for his guest post a while back on sauropod diversity. It never got used and has been sat in my files till I cam across it of late and decided to drag it out and give it an airing. 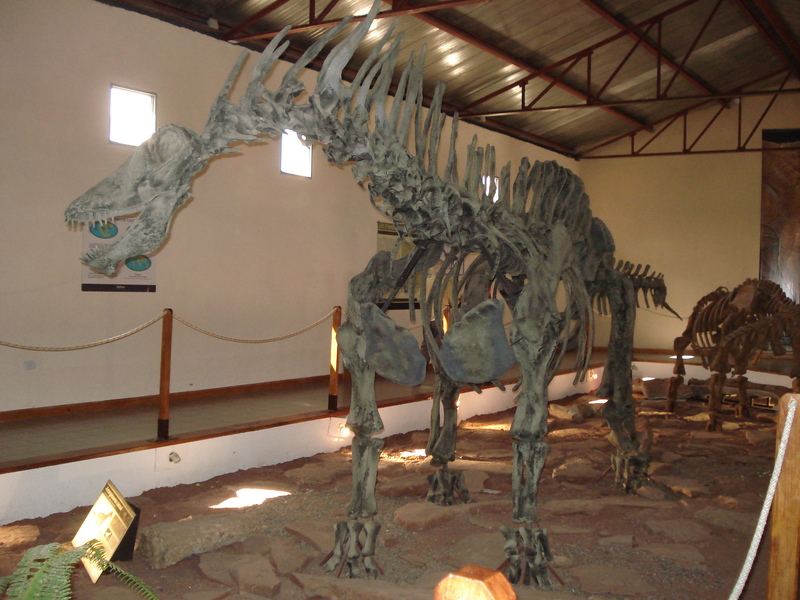 It shows off the bizarre South American sauropod Amargasaurus. This is, justifiably, famous for its groovy spines that extend as a pair of rows along the neck. This calls to mind, if on a smaller scale and rather different form, other ‘crested’ dinosaurs like Ouranosaurus. Much as I do like these, it’s also well worth talking about the fact that this is also one of a rather rare group of sauropods called dicraeosaurids. These are rather few and far between with Amargasaurus and Brachytrachelopan from South America and the eponymous Dicraeosaurus from Tanzania. All three have rather tall and oddly shaped necked vertebrae though obviously this one takes the crown, but more interestingly, they all have very short necks and are relatively small taxa. Short (or at least relatively short) necked sauropods are turning up in increasing numbers though they’re still somewhat rare and the classic body plan of sauropods of a big body with a long neck and tail is hardly in danger, even if the dicraeosaurs are doing their best to challenge this. Long necks have an especially important place in sauropod evolution of course, and I’ll be writing more about that in the next couple of weeks. Stay tuned! 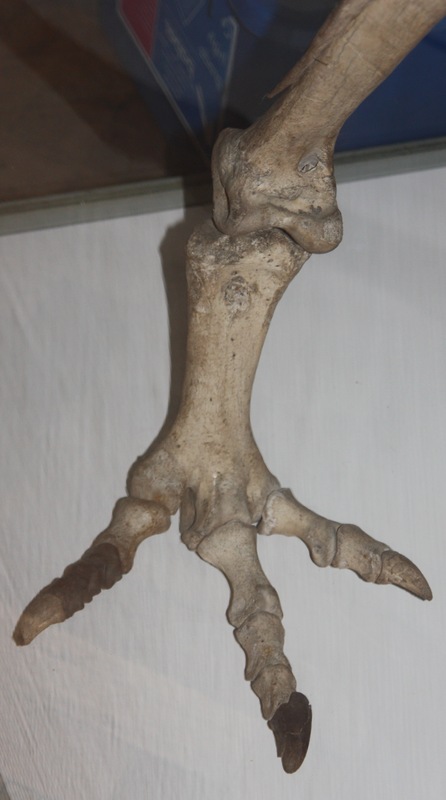 Many moons ago I wrote a short post on the pedal unguals of hadrosaurs and in it I mentioned jsut how similar they are to those of the hand. 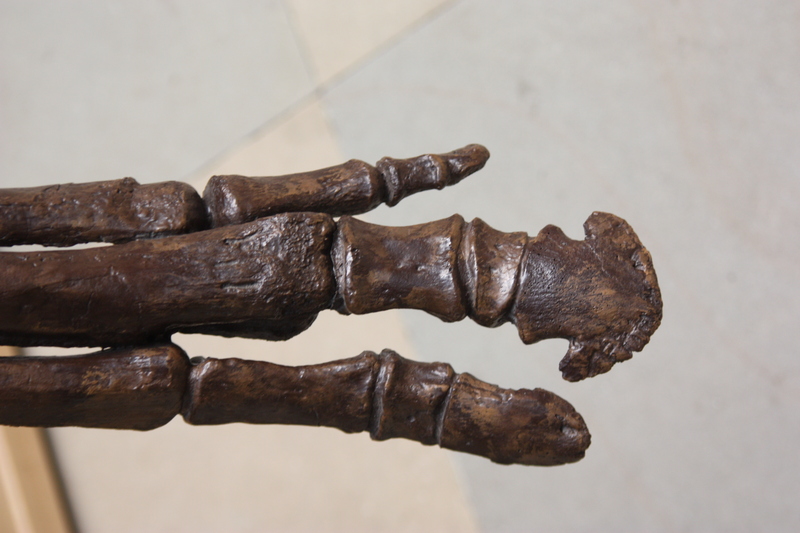 To prove that point, here is a hadrosaurs hand that can be contrasted the the foot from the link above. It’s worth remembering that for a long time the ornithopods (that is hadrosaurs and igunaodontians) were considered proper bipeds and not the facultative bipeds we think of them now. Obviously it’s not like people *didn’t* think about this when they came up with the hypothesis, but one does have to wonder a bit quite what they did think these hands were good for if they weren’t walking on them, especially when they are so obviously similar to the feet which were being walked on. Swimming doesn’t really fit or the toes would be longer and more widely spaced out, and I’m not aware of any other hypotheses that were floating around. Even so, it’s remarkable how some things cling on in the collective conciousness and I still come across the idea that hadrosaurs were semi-aquatic though I think this bit the dust in the 60s if not before. Either this show was not heavily advertised or I missed it completely, but I literally happened to switch on the TV as this started so I inevitably watched it and made a few notes and here’s my thoughts on the subject. I’m not normally a big one for reviews like this, but it almost seemed churlish not to in the circumstances. For those who missed it (or those not in the UK) this was a CG show broadcast jsut yesterday about dinosaurs of the arctic. 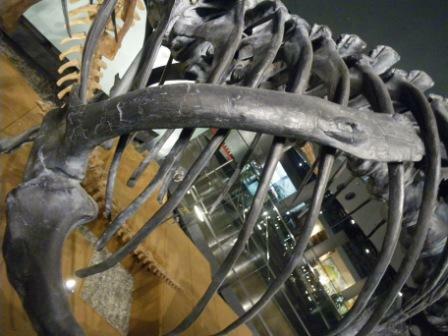 A few years ago I spotted this Allosaurus on display in Japan. As you can see, there appears to be a dent in the scapula surrounded by a ridge of bone. This too me looks suspiciously like a pathology of some kind but the skeleton on display is a cast and I don’t know what specimen it’s based on. I’ve had a quick flick through the literature and while there have been papers on Allosaurus pathologies I’ve not seen anything on the shoulder brought up before. So this post is kinda two pronged – first off: cool an Allosaur pathology! And two, if you’ve seen this exact one before, can you point me to the specimen number or even a paper describing it? Apparently now that I regularly get over 25 000 reader a month, WordPress has started blessing this blog with advertisments. It is, I suppose, something of a badge of honour that enough people are reading my work to make this viable and I can’t complain *too* much given that this platform is free. However, I have to pay for an upgrade to get the advert-free version and sorry guys, that ain’t happening anytime soon. So I (and you) will just have to stomach them for now. More archosaur-based posts coming soon, promise. Today I’m delighted to bring you a guest post by Stephan Lautenschlager. Pterosaur researchers might remember Stephan from the Munich Flugsaurier meeting where he was generous enough to help me arrange the meeting during his last year of study there. 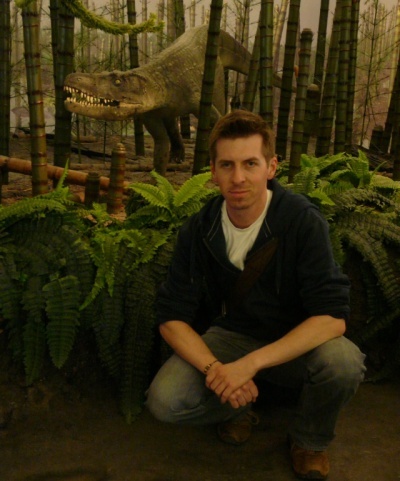 Since then he’s moved on to start a PhD in the UK on therizinosaurs (cool!) and has just returned from a trip to Larry Witmer’s lab. Here he introduces the rauisuchians (a group of archosaurs I really should have written more about before – though the one behind him might be familiar…) and discusses his recent paper on them. Things have been a bit quiet the last few days as I wrap up the last of my marking and teaching this semester (well, till the exams kick in in a couple of weeks). I do have a couple of posts brewing and I’ve been promised a few more guest posts by people (you know who you are!) so normal service should be resumed soon. Probably. More than once I’ve covered issues surrounding how fossils can be displayed as casts, sculptures, real bones, or combinations of these and how these can affect research and viewing things in museums. Here is an example I snapped some time ago which obviously has some current relevance. 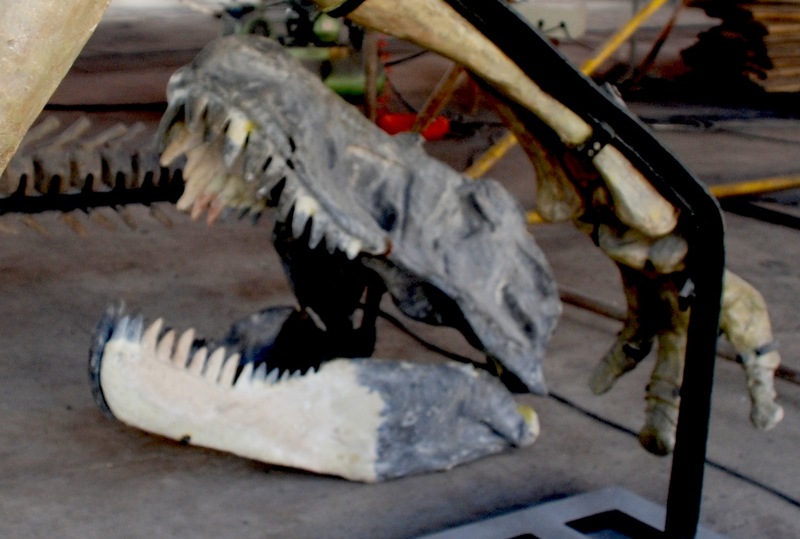 Its designed to be mounted as part of a complete skeleton but here only the skull is visible. I’d forgotten I had this image and it was a bit of a throwaway one (or it might be in focus!) as at the time I didn’t think I’d ever end up working on this and hadn’t actually seen the original bones at that point. I’m rather looking forward to going back and seeing the whole thing at some point, however minor the contributions of a maxilla and dentary are. Still, you can see that the casts of these have been added in with some skill and the colours make it clear what has been reconstructed (right down to the tooth tips in the dentary) which is pretty cool.